I know what you're going to say before you even say it. It goes a little something like, "Those are NOT black and white cookies! Not even close!" And you're absolutely right. 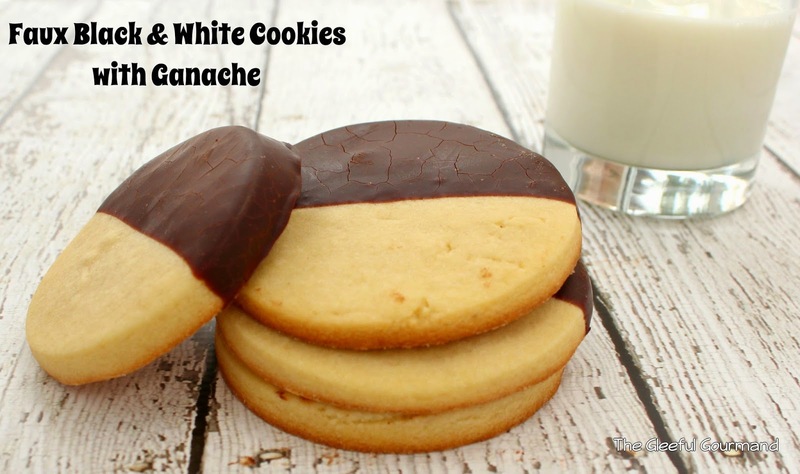 They're not Black & White cookies in the traditional sense, not by a long shot. But if you bear with me, I think you'll begin to see the light on why when it comes to a cookie with a twist, this is one of the easiest and most delicious ways to switch it up. It all began this Valentine's Day with yours truly looking for something new to make the kiddos for a treat. Last year I made a certain cookie, which shall remain nameless (and therefore blameless), on Pinterest that looked like heaven. You probably know which ones I'm hinting at: pudding mixes were employed as well as several forms of chocolate, one of them being M&Ms. Oh, honey, they were decadent. Too decadent. So decadent my kids couldn't even finish a whole one. My own teeth ached from the overload of sweetness. 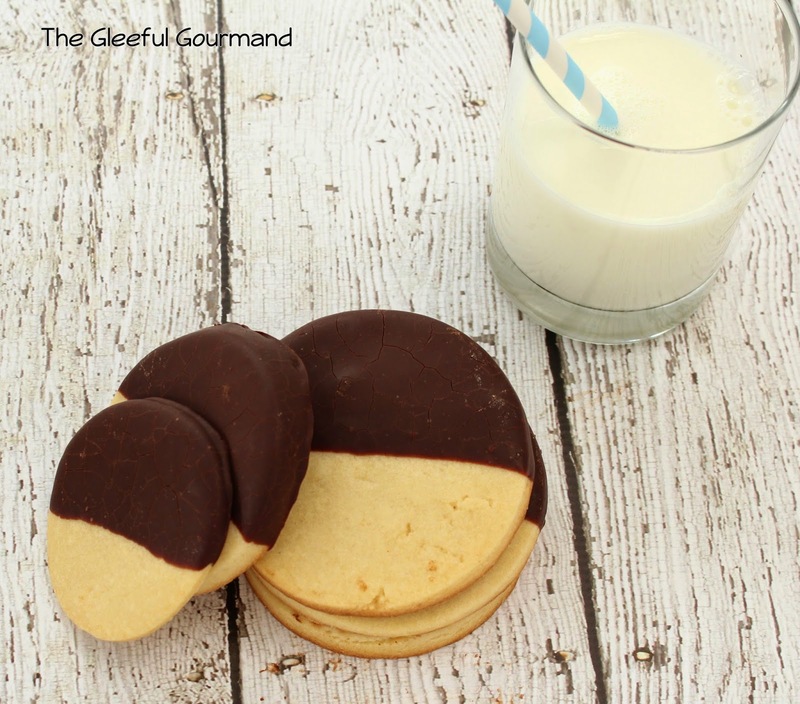 Faux Black & White Cookies with Ganache. The kids asked for them again this year, but I just couldn't go down that road. I wanted something simpler...like a sugar cookie. BUT! Not a sugar cookie like my Mom used to make (sorry Mom, I'm about to throw one of your old standby recipes under the bus here). The sugar cookies I grew up on were probably the same ones you've all had - the recipe coming from Good Housekeeping, circa 1950-something. You know the one. The one that uses cream of tartar. The one that doesn't come together quite right. The one whose dough is impossible to deal with? I liked those cookies growing up, but making them were a pain in the rear when it was my turn to churn them out. No more! There had to be something better. Luckily I remembered that one of my dearest friends, Kirsten, had made some sugar cookies that looked amazing, and easy on her blog. She is truly an artist and decorates her sugar cookies with incredible designs using Royal Icing. I had neither the time, patience, or artistry to attempt that, so it was back to the drawing board. I needed one step below Royal Icing, and one step above just using sprinkles. Kirsten's sugar cookie dough is so simple to pull together, and now that I've made it twice, I can honestly say I've never had sugar cookie making go so smoothly or quickly. After letting the cookies bake and cool, it was on to the ganache. Chocolate Ganache is very simple to make, and it's obviously delicious. But what I really love about it is that shiny, glossy sheen it takes on. I dipped half of each cookie into the mixture, and then put them in the fridge for the ganache to harden. Oh. My. Goodness. The sugar cookie itself is delightful, sweet without being overbearing, firm, and ever-so-slightly crunchy. The ganache sends it over the edge with a velvety delight that literally had me saying "I wish I could have about a half dozen more of those, and not feel bad about it." So without further ado, I give you Faux Black & White Cookie with Ganache. Faux, because obviously one half of the cookie is lacking the white icing of a traditional Black & White Cookie, but simpler, faster, and honestly? Better. For Kirsten's full post on her Iced Sugar Cookies (with awesome tips on how to work that Royal Icing), click here. Using an electric mixer, cream the sugar and butter. Add the egg and extracts until well blended, on a medium low speed. Gradually stir in the flour and salt until well combined. Cover and chill the mixture for at least 30 minutes (an hour is best). Heat oven to 350˚. Liberally dust your workspace with flour (and don't forget to flour your rolling pin). Roll the dough out to an even thickness of about 1/4 an inch or a little more. 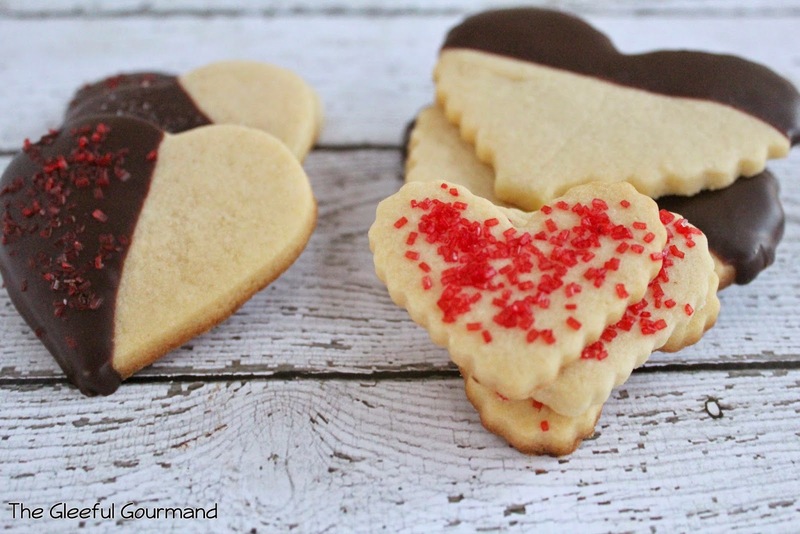 Dip your cookie cutter in a little flour, and start cutting. Place cookies on a greased baking sheet and bake for 10-12 minutes, or until the edges are just starting to brown. Remove and cool completely. Take remaining dough, gently work it back together into a ball, and continue the process until all the dough has been used. *Kirsten's recipe is most likely a riff on Paula Deen's recipe for sugar cookies. Just wanted to make sure credit was given where credit is due. In a small saucepan, bring the cream just to a boil over medium heat. Remove from heat and stir in chopped chocolate with a small whisk. The mixture will look grainy at first. Keep stirring until all the chocolate is melted, and the ganache is smooth with a glossy sheen. Let cool very slightly (it's not necessary to cool completely) and dip the cookies in whatever manner suits your fancy. Place on a pan that is covered in parchment paper. Let cool in the fridge for about 20 minutes, or until the ganache sets. * I use bittersweet chocolate because the sugar cookie is sweet enough, and the 60% cacao makes for a lovely, very subtle contrast. The batch I made for Valentine's Day. The kids went crazy for them! Oh my gosh I will trade all of my royal icing for some ganache.These look AMAZING. Pinned! Okay so here's the other best thing: the ganache recipe makes quite a lot. Put the rest in a container and into the fridge. Wait a few hours. Take out spoon. Carve out truffles from the hardened ganache. Pass out from the ecstasy of it all. I've always been scared of making "ganache" - sounds so intimidating. Your instructions make it look easy. Thanks for reading, Sarah! Yes - ganache is SO easy! But I know what you mean. It's actually hard to screw ganache up if you follow the recipe. I hope you'll give it a try and let me know how it turns out!